While much of the United States begins to experience colder weather in December, Orlando still offers visitors a chance to bask in warm, dry weather, perfect for a seasonal trip to one of the city's most popular theme parks, Universal Orlando. Whether you're planning a Christmas vacation or just want to escape for a weekend of fun at this world-renowned resort, December is a great time to visit Universal Orlando—just make sure you know what to expect before you plan your trip. Since the hurricane season in Florida ended with November, the tropics are no longer a worry this time of year. Instead, December brings comfortable days and cool evenings to Universal Orlando. If you want to enjoy all the fun of the parks without suffering in the heat, then this month is a good time to go. However, while hurricane season may have ended, Orlando still receives about 2 inches of rain over the course of December, with an average of six to seven days of precipitation this month. Fortunately, visitors will be treated to around seven hours of sunshine and 10 hours of daylight throughout most of the month—even though December's days are the shortest of the year. When visiting Orlando in the late fall and early winter, layering is key—especially if you plan to be out all day and into the evening. Since temperatures can drop up to 30 degrees Fahrenheit between day and night, you'll want to bring a variety of short and long-sleeved shirts, shorts, and pants as well as a light sweater in case you're prone to getting cold. Because Universal Orlando is so large and you'll mostly be traveling around the park on foot, you'll also want to be sure to bring comfortable walking shoes. Be sure to pack at least one suitable outfit if you plan on dining out at one of Orlando's more stylish restaurants or taking in a nightclub, plus festive holiday attire will help put you in the mood for completing your shopping. Also, don't forget your swimsuit for frolicking in the Universal Orlando Hotel's heated swimming pools. It may also be wise to bring a fanny pack or another similar bag for your personal belongings like your phone and wallet. December's prime event at Universal Orlando is Grinchmas, featuring the big green Grinch himself. Expect to see great decorations, fun parades, and seasonal events when you visit Universal's Islands of Adventure in December. 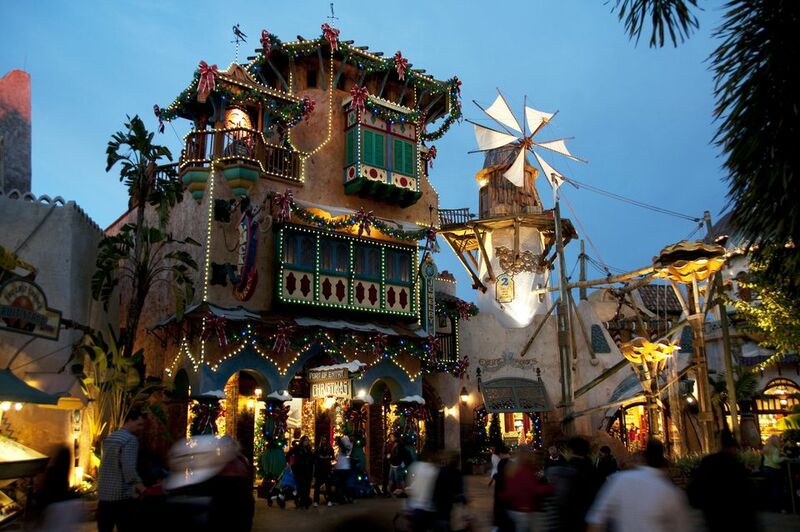 Grichmas: Visit Suess Landing for a holiday spectacular complete with a live retelling of the classic Dr. Suess story, "How the Grinch Stole Christmas," which happens daily from mid-November through January. Christmas in The Wizarding World of Harry Potter: At Universal Studios, Diagon Alley and London get a holiday makeover complete with festive decor, plenty of special holiday drinks and eats, and even a special performance by Celestina Warbeck and the Banshees at King's Cross Station. Meanwhile, Hogsmeade and Hogwarts at Universal's Islands of Adventure are lit up for the occasion while The Frog Choir sings seasonal melodies all month long. Macy's Holiday Parade: Special guests such as the Minions from the "Despicable Me" franchise take over the annual event, joining Santa Claus for daily parades that also feature other favorite Universal characters like Shrek and the cast of "Madagascar." Universal CityWalk's EVE: Known as the park's biggest party of the year, the New Year's Eve celebration welcomes guests to a private ticketed event at CityWalk, where champagne, fireworks, and live music will help you ring in the New Year. While the weather will be ideal, expect to run into some crowded conditions at Universal Orlando in December. Islands of Adventure will be particularly crowded since both Grinchmas and the popular Wizarding World of Harry Potter are in this area. There will be pockets of lower attendance at the beginning of the month, but anticipate large crowds as the month progresses, peaking during the week between Christmas and New Year's Eve. Give yourself plenty of time to travel to the Universal Orlando theme parks if you are not staying on-site and try to arrive around opening time to make the most of your day at the park. Consider bypassing watery rides at the Islands of Adventure and Universal Orlando; you will get wet and the day may be too cool for comfort. Pick up holiday gifts that you just can't find anywhere else when you visit Universal Orlando during December; that way, you'll enjoy a fun vacation and finish your Christmas shopping in a festive environment. Will You Have What it Takes to Race Jimmy Fallon at Universal?